After visiting the AmazonSmile site, you can adjust your settings below the search bar at the top of the page. Hover over the “Supporting: …” portion of the page and an information window will pop up. You can Change or Set the organization you want to support by clicking the appropriate hyperlink (e.g., “Change” if you already have an organization set and want to change it). 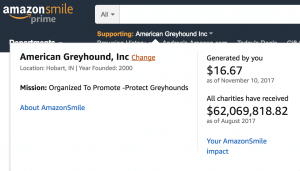 You will then be able to search from a wide variety of organizations to support, including American Greyhound. Just scroll down after the list of spotlight charities to “pick your own charitable organization”. Any eligible purchases you make will have a portion go towards the organization you support. Just make sure to use the AmazonSmile URL when shopping Amazon in a web browser. 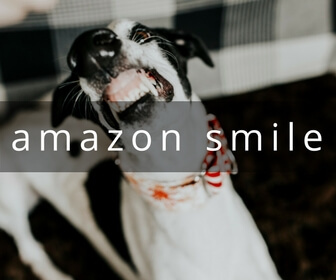 Read more about AmazonSmile at Amazon.